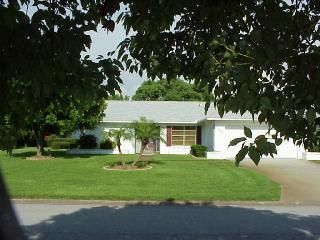 This very nice Florida home is fully furnished. There are separate living and family rooms, a diningroom, and eat in kitchen. The garage has room for two cars. A laundry room with washer and dryer are provided. The house is turnkey furnished with linens, dishes, and cookware provided. Also included is internet and local phone service as well as a house security system. The yard is maintained by a professional service. Central Heat & Air, Cable TV. Very nice house. Close to everything and quiet neighborhood with friendly people. I would definetly rent this place again. We stayed at the property for a month while working in Florida, it was a nice place to stay, everything was clean when we got there. Everything that you need to feel like home is there, the kitchen is well stocked with all the needed cooking utensils. There is a garage to park in which I suggest if you keep your car clean , there is a sprinkler system in the yard and when it comes on, it will put white hard to remove white water spots all over your car. All that we hoped for and more. The beautiful Gulf of Mexico beaches are only ten minutes away. courses are within a short distance. located close to this very centrally located property. less than ten miles away in Sarasota. popular farmers market every Saturday morning. charter boats available for deep sea fishing.